The idea for a kilt skate to celebrate Scottish heritage began in Ottawa in 2014 when the Scottish Society of Ottawa sought a way to commemorate the upcoming bicentennial of the birth of Sir John A. Macdonald, the architect of Confederation and Canada’s first Prime Minister. They approached Don Cummer, who for many years had been skating the Rideau Canal in his kilt each January to celebrate Sir John A’s birthday. They asked him if he would help organize something on a city-wide scale. The scale quickly became nation-wide when the Department of Canadian Heritage said they would be interested in helping fund a kilt skate to celebrate Sir John A’s bicentennial, but only if it took place in at least three different provinces. Within a week, Cummer and SSO had lined up organizations interested in launching the inaugural Sir John A’s Great Canadian Kilt Skate in Montreal, Winnipeg, Saskatoon and Calgary — as well as Ottawa. Toronto was not among the first kilt skate cities. None of the Toronto-based Scottish organizations contacted responded to the SSO’s invitation to participate. Nor did they respond to invitations to join in the celebrations for 2016. But Cummer would not give up. In January, 2016, he travelled to Toronto to stage a one-man kilt skate on the public rink at Nathan Phillips Square in the heart of the city. His antics drew the attention of amused skaters and other passers-by. The idea of skating with a Scottish flag fastened to a hockey stick appealed to a classroom of middle-grade students that had taken to the ice as part of their school excursion. 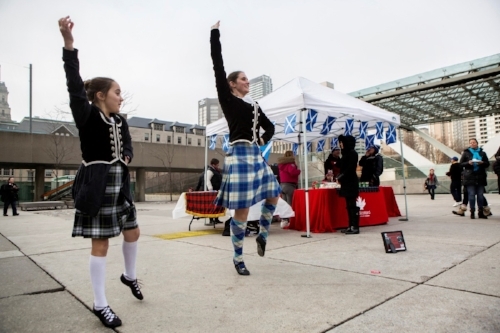 Cummer returned to Ottawa convinced that Toronto’s Nathan Phillips Square would be ideal for a kilt skate that — given the size of Toronto and the strength of the Scottish community there — could become the biggest in Canada. Cummer found people who shared his vision for a kilt skate in Toronto. Two in particular were instrumental in creating the Toronto event. Chris Maskell was newly appointed as the Scottish Government’s representative in Canada with a mandate to promote tourism and trade, and highlight a dynamic, forward-looking Scotland that was proud of the reach of its cultural heritage around the world. Chris saw the kilt skate as an ideal way to gain exposure of Scotland and, based in Toronto, he wanted to see a big event in the city. Chris also arranged funding from the Scottish Government to help support a national event. And finally an individual stepped forward willing to organize a Toronto event. Kimberley Henwood of the Sons of Scotland Benevolent Association and Treasurer of the Clans and Scottish Societies of Canada offered to work with SSO on an event for January 2017. With funding from the Scottish Government, organizational support from SSO’s Sue MacGregor, and the set-up and tear-down muscle provided by her family and friends, Kimberley went to work. At first, the City of Toronto wanted to shunt the event off to a community park in Toronto’s east end, but with Sue MacGregor’s help and political contacts, Kimberley was able to nail down the iconic Nathan Phillips Square as a venue. But choosing such an important public space has its risks as well as benefits. The date and location of the kilt skate was also chosen as the destination of the Women’s March to protest the inauguration of President Trump. Some 60,000 protesters — many wearing knitted pink pussycat hats — rallied at Nathan Phillips Square later that afternoon. Toronto’s inaugural Sir John A’s Great Canadian Kilt Skate was scheduled to finish before the protest march would arrive, but it is possible that the prospect of the demonstration dissuaded some families from attending the event. Kimberley couldn’t control factors such as a protest march, but she did deliver on the elements of the event that were under her control. Entertainment that celebrated Scottish culture. Opening ceremonies that included the Honourable Kirsty Duncan, Canada’s Minister of Science and Minister of Sport and Persons with Disabilities. And not to mention an excellent photographer, Toronto Events Photography, whose shots became the image of the 2017 kilt skate season. It’s estimated that about 40-50 kilted or tartaned skaters showed up for the 2017 Toronto event. The numbers were less than the organizers hoped for, but soon after they began planning for the 2018 event. Promotions included the participation of Chris Maskell and his colleague Tourism Scotland’s Richad Knight, as well as Kimberley Henwood, Sue MacGregor and Don Cummer at the 2017 Scottish North American Leadership Conference which brought together Scottish Societies from across the continent. They took every opportunity to promote the kilt skate nationally and in Toronto. Meanwhile, Sue MacGregor and art designer, John Theoret, were putting together a marketing package. The funding from the Scottish Government arrived early enough in 2017 for them to put in place a media campaign for January 2018 that included posters and table-toppers for each partner city. This was followed up with Facebook ads for each of the seven events nation-wide. In Toronto, Kimberley Henwood was very effective in using the Great Canadian Kilt Skate Facebook page set up by Montreal’s Gillian Leitch to attract thousands of “likes” for the Toronto event. On the day of the skate, the weather cooperated. The rain stopped. The sun shone. And the mid-afternoon temperatures were slightly above freezing, but the refrigerated ice was in excellent condition. Hundreds showed up in kilts and tartans for Toronto’s 2018 Sir John A’s Great Canadian Kilt Skate. The images were captured by Don and by Toronto photographer Dan Campbell. In November, 2018, Toronto was named the 2018 Kilt Skate Capital of Canada. It had come a long way from the cold morning two years before when one individual tested the waters — or rather, the ice. Kimberley Henwood has already set Sunday, January 27, 2019, as the date for the next Great Canadian Kilt Skate in Toronto. Working with the Clans and Scottish Societies of Canada on the Toronto event, and with the Scottish Society of Ottawa which is coordinating the national event, she has plans to make it bigger than ever.